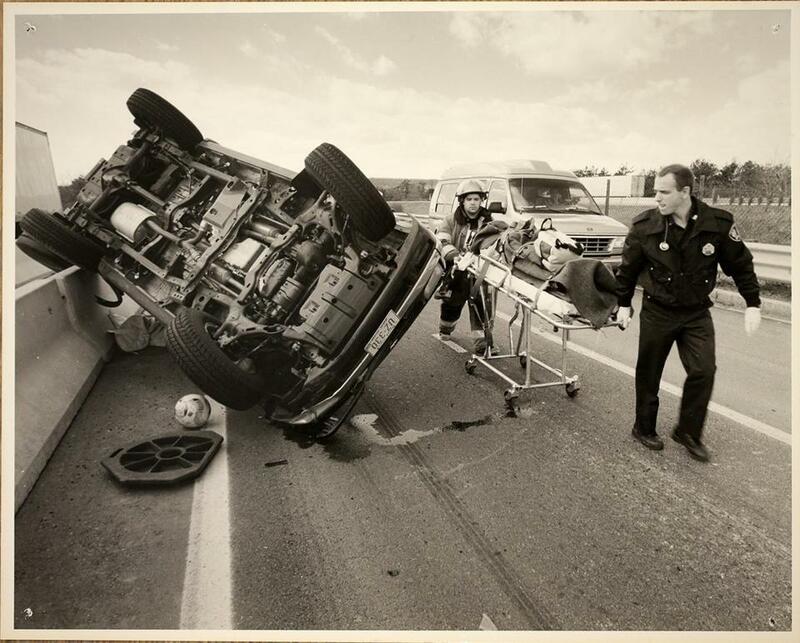 A photo in Rick Stack&apos;s collection shows him (right) at the scene of a car crash. 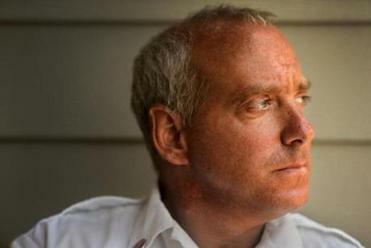 Captain Rick Stack, a long-time North Attleboro firefighter, has been diagnosed with PTSD. That command was what Stack aspired to as he strode across spilled gasoline and broken glass at accidents, or charged into rooms electric with panic on medical calls. It was a gift he could give people in the worst moments of their lives: the relief of seeing someone take control. At his best, Stack says, it felt like he could do anything — and like nothing he walked into could touch him, no matter how bad. For a long time, first responders’ mental health wasn’t talked about much — and that was just the way they liked it. Admissions of inner turmoil were akin to weakness in a vocation that requires emotional strength. But the silence never meant that all was well. A recent report from the Boston-based Ruderman Family Foundation shows in alarming detail that the internal struggles of police and firefighters take a devastating toll. Help is available for first responders and others who suffer from post-traumatic stress. At a time when the suicide rate has been climbing across the United States, the rate for firefighters may be even higher than that for the general population, according to the report. There were 92 verified firefighter suicides and 17 suicides of emergency medical technicians nationwide in 2017, according to the Firefighter Behavioral Health Alliance, an Arizona nonprofit that has collected the data since 2011. That’s 50 percent more than the number of firefighters who died last year while on duty, according to the Quincy-based National Fire Protection Association, which tallied 60 on-the-job deaths last year. In Massachusetts, at least 22 firefighters and four EMS workers have died by suicide since 1996, according to the report. And the actual number of first responder suicides statewide and nationally is almost certainly higher, the study noted. By some estimates, fewer than half of all firefighter suicides are reported. Given the number of critical incidents firefighters witness, it would be abnormal if post traumatic stress disorder didn’t affect them, said Heyman. But firefighters are so strongly oriented toward helping others, she said, it can feel unnatural to them to seek help for themselves. And they often fear that if they do, their jobs could be at risk. Jeff Dill, a former firefighter and the founder of the Firefighter Behavioral Health Alliance, said he saw a half dozen cases across the country last year where firefighters were fired after they were diagnosed with PTSD. The US military, itself a deeply traditional culture, “is years ahead of firefighting in terms of dealing with the stigma,” said Dr. Abby Morris, medical director at a new, 64-bed treatment program for firefighters in Maryland, the International Association of Fire Fighters Center of Excellence, a union initiative that has helped about 400 firefighters since it opened last March. A Florida State University survey of more than 1,000 firefighters across the country found that nearly half, 46.8 percent, had thought about suicide at least once during their careers. Yet despite their heightened risk, most firefighters have only recently begun to be trained in managing their own mental health. For years, many of them, like Stack, instead learned to practice denial. On the night he first imagined becoming a first responder, Stack says, he was a scared 14-year-old, watching helplessly as his grandfather struggled with brain cancer. When an ambulance arrived and the medics took charge, the young Stack made up his mind: He would be like them someday, ready to step up and take action in a crisis. After high school, he went to work as an aide in a small hospital emergency department. He assisted in all kinds of crises — overdoses, accident victims, fatalities — learning from the doctors and nurses he shadowed. In college, he trained as a paramedic, and then went to work on an ambulance in Somerville and Chelsea, where he saw an even wider range of trauma. Unsure how best to fulfill his drive to help, Stack earned a bachelor’s degree in psychology and enrolled in a graduate social work program at Boston College. He took the civil service exam, the first step toward a career as a firefighter or police officer, and in 1997, when his name came up for a firefighting job in North Attleborough, he leapt at the opportunity. From the start, Stack loved being a firefighter. He still used the expertise he’d honed as a paramedic, but he also learned a whole new set of lifesaving skills. Nothing matched the rush of nervous excitement he felt arriving at a scene and charging in to try and bring order to chaos. There were exhilarating moments — helping to deliver a baby in a bathtub, restarting a man’s heart with a jolt from a defibrillator. But in time, he saw that those clear victories were rare. What stuck with him weren’t the moments of glory, but the close encounters with suffering and death: the 26-year-old Walpole man, severely burned by a gasoline fire in 2005, whose body left a blackened imprint on the ground beneath him; the young woman whose hand he held after an accident — her grip so tight he thought she would break his fingers — as they waited for a medical helicopter to arrive. Stack recalls doing what he always did at such moments: reassuring her that she was not alone, that help was coming. Before it did, though, he says, she let go of his hand. He knew then that there was nothing that could save her. Death, violent and sudden, became routine. 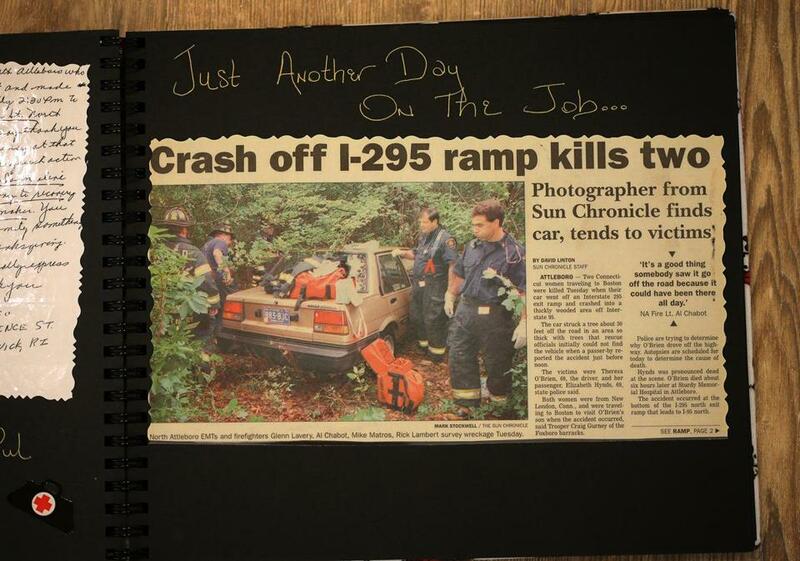 In the scrapbook his wife made for him, a treasured gift early in his career, one page features a news clipping about a double fatal car wreck on Interstate 295. “Just Another Day On The Job,” Stack’s wife wrote above it. Captain Rick Stack at home on his patio. One day when Stack was driving, a song by the Canadian band Len came on the radio. Instantly, he says, it transported him back to a long-ago accident scene, a car that had crashed into a parked tractor trailer in an Interstate 95 rest area. Stack hadn’t realized he had held onto the memory in such detail, but all at once he says he could smell the gasoline again, hear the glass crunch underneath his boots. He could see the crumpled vehicle, and the dead or dying driver, his head down. Somehow, the car’s radio had still been playing, Stack says, the upbeat song “Steal My Sunshine” blaring on across the horror. He knew, as the memory made his heart race, that what was happening to him wasn’t normal. But he didn’t know what it was, or how to make it stop. Locked within each of our memories, along with sounds and smells and pictures, are emotions linked to past experiences. Trouble arises when the so-called emotional memory runs amok, stirring up fear and dread long after the initial danger or horror has passed. Treatment often involves “re-processing” memories, and reframing attached negative feelings, to gradually sap them of their disruptive power. Firefighters may be more vulnerable to PTSD than the rest of us, experts say. They work long, unusual hours and often lose sleep, irregularities linked in some studies to increased risk of mental health disorders. In addition, many of the firefighters treated for PTSD at the IAFF treatment center suffered some kind of childhood trauma that may have predisposed them to the disorder, said Morris, the medical director. Rick Stack was already attuned to life’s fragility when the 2001 birth of his daughter made him even more sensitive to the losses he encountered on the job. One night when his daughter was young, Stack says, he responded to a call about a baby who wasn’t breathing. As he remembers that night, his hands shook uncontrollably as he tried to help the unresponsive infant. It felt to Stack that everyone could see that he was struggling, that his dark secret had emerged into the open. Even worse, his anxiety had interfered with his work. Now he would worry, every time he rushed to a call, that his internal unrest might prevent him from performing critical tasks. All he cared about was helping people. If he couldn’t do that anymore, he wondered, what good was he? The baby didn’t make it, and afterward, Stack said, he and the other first responders participated in a stress debriefing, a long-established routine after difficult calls, designed to help them process the event and prevent PTSD. Across Massachusetts, 18 regional teams of firefighters, chaplains, and clinicians are trained to run the critical incident stress management debriefings, nearly 1,000 of which take place every year, according to fire officials. After the debriefing, further counseling was offered, through the town’s employee assistance program. Stack says he figured that would just make his inner struggle more public. And he says he doubted that a program designed for general use, by employees townwide, could deal with his extreme experiences as a firefighter. That doubt is widespread among struggling first responders, and often deters them from seeking treatment, said doctors who treat firefighters with PTSD and former firefighters who now work in advocacy and treatment. Slowly, specialized programs and counselors are emerging to meet their unique needs, and as more firefighters ask for help, the demand is growing. “As the stigma starts to slide away, and people realize the problem is real, there is greater need out there,” said Brian Claffey, a former Hull firefighter and the residential coordinator at the On-Site Academy treatment center in Westminster, where there are 10 beds for first responders, and hopes of expanding. Stack tried to move forward, but the baby’s face stayed with him. He says he continued to relive the call — the open front door, the family’s pain — and that he felt a keen sense of failure. Some nights he says he woke up screaming, unable to remember what inner terror had gripped him. A hopelessness took up residence in his chest. The sadness stayed with him no matter what he did — running marathons; starting a landscaping business on the side; earning two more degrees, in fire science and public administration, to further his long-term goal of becoming a fire chief. Seeing no other way to escape his pain, Stack says he attempted suicide in 2015. Afterward, he told no one what he had done, and tried to hide his growing desperation. But his wife had grown deeply concerned about his state of mind, and some of his colleagues had, too. One night, a pair of them showed up at his door, an intervention arranged with his wife without his knowledge. They told him they were worried, that he needed help, and that they would take him to the hospital to get it. Not tomorrow, not next week, but right now. Tonight. Upset and embarrassed, Stack resisted until he realized they weren’t going to give up. One of his colleagues, a fellow lieutenant, accompanied him to the hospital, and waited with him for hours in the emergency department. That long night would set Stack on a path to treatment. But accepting his diagnosis wasn’t easy. He still remembers the shock he felt the first time a doctor asked him if he’d ever heard of PTSD. “Of course,” Stack says he answered. But he could not believe that he might have it. A newspaper story and photo from Captain Rick Stack's scrapbook attests to the difficult scenes he has witnessed. His wife wrote "Just another day on the job..." in the book. He took time off from work, and sought help in a specialized treatment program for first responders and veterans at McLean Hospital in Belmont, established in the wake of the Boston Marathon bombing, where more than 500 patients have been helped since 2014. In the program, known as LEADER, Stack began to understand what was happening inside his brain — and began to believe that it was PTSD, in addition to depression and anxiety. He returned to work. About a year after his diagnosis, in 2016, he was promoted to acting captain. 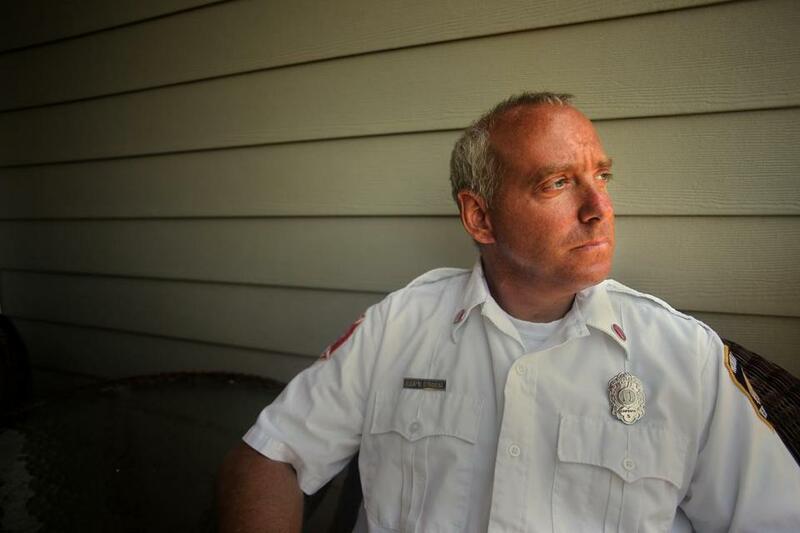 It was the natural next step on a ladder he had long hoped would lead to becoming a fire chief — and it felt like a miracle to Stack, that a PTSD diagnosis had failed to derail his career. He had faced his demons, and he finally knew what was wrong. But the dark and powerful memories that plagued him would prove harder to contain than Stack had ever imagined. On a Saturday afternoon last February, two years after his PTSD diagnosis, Stack was off duty, driving his truck on Route 146 in Rhode Island, when he says he happened upon a fatal accident. A pedestrian had been killed by a tractor trailer. Stack says he called 911 and continued on his way, but the unexpected encounter cued a firestorm of memories. Three days later, he returned to work as scheduled at the firehouse. That morning, Stack says, he was set to begin training a new recruit. He remembers stepping into the room and introducing himself — and then, he says, inside his brain, the floodgates opened. According to Stack, his traumatic memories began to flash before him, like a high-speed movie reel only he could see. The baby who could not be saved; the burned man in the grass; the young accident victim gripping his hand — the calls he could not forget came to him again. He had carried each of them with him for as long as he could. And he could not bear the burden any longer. “Excuse me,” he says he managed to tell the new recruit. He left the room and found one of his colleagues. Then he made his way to the chief. “I need some help,” Stack remembers telling him, voice shaking. Every word felt to him like a stab wound as he spoke it, the sharp pang of knowing what he had set in motion. There would be more doctors, more hospitals, more questions. Worst of all, there would be time away from the job he still loved. Who knew when, or if, he would make it back? At the hospital, Stack was assessed and found to be suicidal, again. He started back down the long road to recovery. In time, without aid from his insurer, which he says declined to pay for the out-of-state program — but with generous financial assistance from his union — Stack spent 45 days at the Center for Excellence in Maryland. There, he bonded with other firefighters who had lived with the same trauma and suffered the same symptoms. With them, and with staff clinicians trained to understand the rigors of his work, he didn’t have to explain everything he’d been through. For the first time in years, he began to feel normal. He stayed in touch with the peers he’d met there, texting or e-mailing them to offer or receive continuing support. The more he reflected on his journey, the more Stack felt compelled to speak up about it. Rick Stack never returned to his firehouse. He went out on medical leave, and then, at 49 years old, in consultation with his doctors, he decided it was time to retire. 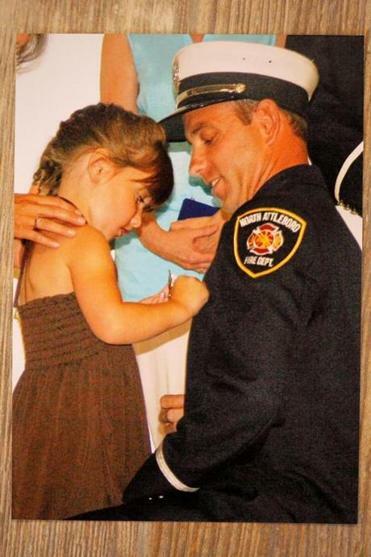 A personal photo shows Captain Rick Stack getting pinned with his young daughter when he was promoted. The decision caused him yet more pain, he says; he had never been someone who gave up. In spite of what his long career had cost him — the anxiety that flared whenever he heard sirens — there was still nowhere else he’d rather be. Instead he focused on taking care of himself, running 5 miles a day and keeping up with his counseling. His marriage ended, after 18 years, and he moved into a new home and imagined a new career as a college teacher. He wrote about his experience, and published essays about his path to treatment in trade magazines for firefighters. Unable to help people as he always had, he sought other ways to offer hope and comfort. He lives for the moments, precious and rare, when confirmation comes that he’s reached someone. Checking his e-mail inbox one day this summer, Stack found a note from a firefighter in Maryland who had read one of the articles he’d written. The gratitude from a stranger lifted him, but Stack feels compelled to do more, though he knows his own recovery is unfinished. He intends to keep speaking out about his experience, he says, to continue charging in to try and help — in a different way, in a different kind of darkness.